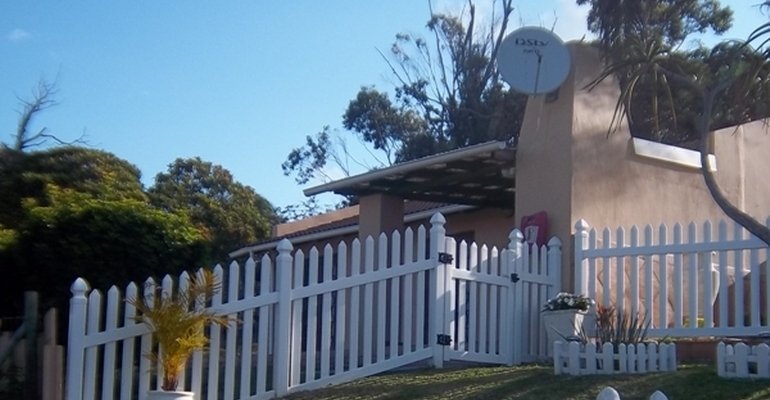 Glen Eagles 23 is a spacious holiday house situated in Port Edward in a security complex and can sleep up to 6 people. The house consists of 3 bedrooms that are each furnished with a double bed, and the rooms share the use of 2 bathrooms. All linen are supplied but guests need to bring their own bath and beach towels. The open-plan kitchen is equipped with a stove and oven, a microwave, a fridge, as well as tea-and-coffee-making facilities. Meals can be enjoyed at the dining table, and guests can relax in the lounge which has a TV, a DStv connection point is available but guests need to bring their own decoder and smart card to view DStv. The living area opens onto a stoep with a built-in braai area and has a partial sea view. Undercover parking for 1 vehicle is provided. Glen Eagles 23 is just 800 m to the Port Edward Country Club, and is just 1.8 km to the main swimming beach. Port Edwards offers various restaurants, as well as activities such as fishing, surfing, walking- and mountain biking trails. Guests can also visit the various attractions such as the Port Edward Lighthouse, the Red Desert Nature Conservation Area, the Wild Waves Water Park, and more.